My immediate response is no – most video games are generally described as works of fiction and that isn’t any different here. The game isn’t intended to educate - it is intended to entertain. Any education you pick up on the way is just bonus points. That said, I’ve always admired Ubisoft’s painstaking efforts in creating a near-historical representation of the time periods visited in their games. AC II, Brotherhood, and Revelations let us experience The Italian Renaissance, Assassin’s Creed III let me explore my hometown, New York City, before it became the metropolis it is today – just walking down some of the streets in 1700’s downtown Manhattan felt so familiar yet surreal. Go to downtown today and you’ll notice the street signs are in black, compared to sea of green the rest of the city has. Those black signs tell you that you’re walking through one of the very first streets when New York City was under Dutch rule, and delightfully, AC III matches up pretty close. But what made many of the games memorable is how they build stories tied to real-world characters and events. I loved Edward “Blackbeard” Thatch’s characterization in AC: Black Flag. It was actually quite a surprise to see that the man was very warm and avuncular, but still carried the authoritative image that I’ve always imagined him to have. That said, I can’t go around assuming that’s how Blackbeard actually was during the pirating days. Most of what we know about European pirates fall victim to the same fate of Cleopatra’s depiction in Origins. Truth be told, almost all pirate lore that we see in cinema and pop culture come from a 1700s book called “A History of the Robberies and Murders of The Most Notorious Pirates and Also Their Polices, Discipline and Government” (Wow. What a hella long name.). This book defined pirates in the minds of the Western world, but no one really knows the real identity of the author, and it remains a mystery to this day. What also stills remains a mystery is the sources the author picked - there likely weren’t many. I’m sure Ubisoft did more research to flesh out the world and characters of Black Flag (Under The Black Flag by David Cordingly supposedly shares a more accurate history of Western pirates), but I wouldn’t be surprised if they felt some of the questionable source material from one of the very first pirate books fit well within in their game. 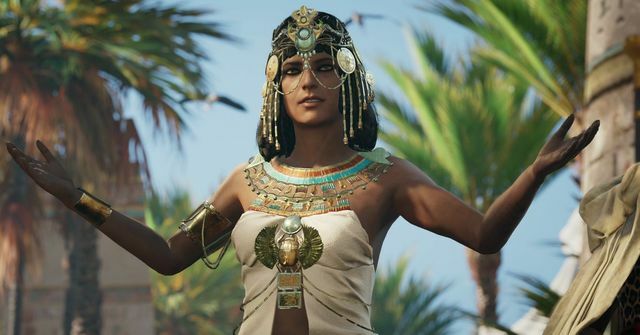 I haven’t played Origins yet, but I’m excited to, so I can’t really share my opinion on how I feel about Cleopatra’s depiction in the game. I really appreciate the insights Colin and the many classicists he spoke to in order to uncover the real Cleopatra. I think it’s also a good reminder that, unless otherwise specified, we shouldn’t look to video games as an interactive history book. When we picture ourselves in the world of ancient Egypt, medieval towns, or even the fictional offices of Abstergo, we are immersing ourselves into a fantasy created by developers to enhance that fantasy. That said, maybe the impressions and propaganda the Romans left about Cleopatra was what was needed to build a good immersive story for Origins. And just like a good movie that is “based on a true story”, I’m totally okay if developers need to bend the truth a little to deliver something memorable. "By our standards these were not necessarily 'good' or 'moral' people," says Tyldesley. "But there is nothing to suggest that Cleopatra was any different to the rest of her family. Unfortunately, we seem fascinated by the idea of her as a powerful and sexually active woman."